The Bi-State Development Board of Commissioners has approved a $22 million, three-year capital improvements package, as part of an ongoing effort to develop their St. Louis Downtown Airport as both a commercial and general aviation facility — as well as and spur additional development in the adjacent Sauget Business Park. The capital improvements program, approved April 27 in conjunction with the regional transportation agency’s fiscal year 2018 budget, is designed primarily to help the airport accommodate large commercial charter aircraft. That, administrators say, will facilitate a long-range strategic plan to encourage additional construction in the business park and eventual expansion of the airport-industrial park complex. 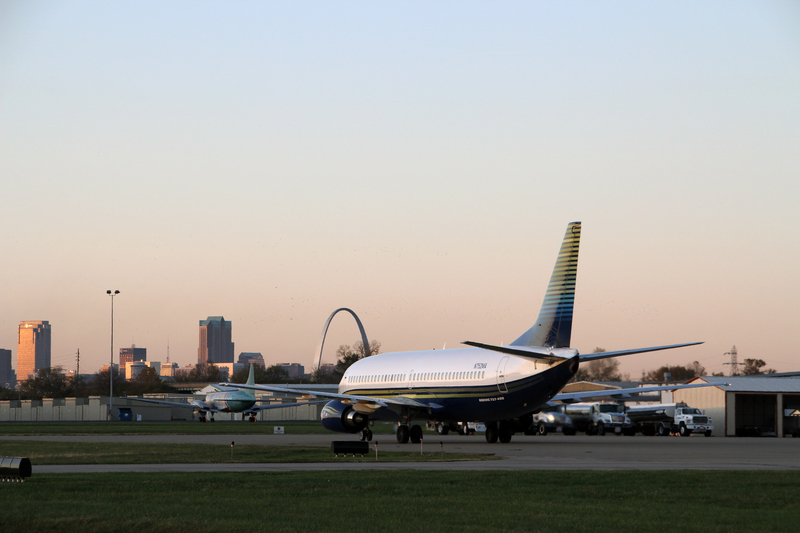 With three runways and two terminals, St. Louis Downtown is already the St. Louis region’s second most active general aviation airport and the busiest in Illinois outside of Chicago. The adjoining Sauget Business Park, administrators add, now boasts some 20 major tenants including a half-million-square-foot Medline Industries medical supplies distribution center, a Holton Meats processing plant and a FedEx distribution center. Together, the airport and business park now span some 1,000-plus acres of Cahokia and Sauget. Proof, administrations say, that the often-controversial complex has found a footing for long-term sustainability. Additional growth, they note, would be good news for the Village of Cahokia; where economic conditions have often been tied to those of the airfield. Opened in 1929 as Curtiss-Steinberg Airport, the facility quickly became home to the Parks Air College, the first Civilian Pilot Training Program ever licensed by the Federal Aviation Administration (FAA). Over the following years, thousands of pilots and aircraft mechanics would be trained at the facility, including more than 37,000 U.S. Army Air Corps cadets during World War II. At its peak, the college encompassed 18 instructional buildings and dormitories. Students manufactured a line of airplanes and operated a regional airline. However, in 1996, St. Louis University (SLU) — to which founder Oliver Parks had donated the college – transferred most operations to its main campus in St. Louis. Two regional carriers, Air Mid-America in the 1970s and Air Midwest in the 1980s, would offer commercial service from the airport but ultimately fail. 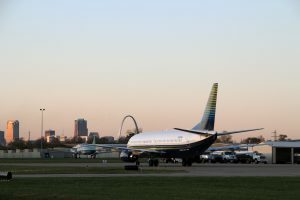 Bi-State Development, primarily known for operating the St. Louis area’s public transit system, took ownership of the airfield in 1965, after general aviation operations there ceased, and has worked since to develop it. To facilitate the return of commercial air traffic, St. Louis Downtown administrators now plan taxiway improvements to accommodate the type of large charter aircraft often used by sports teams. New rounded “fillets” — the corners where taxiways intersect with runways — are planned to accommodate the larger turning radiuses required for larger aircraft. Runway and taxiway intersections are to be repainted in line with current FAA requirements. Also planned are a number of safety improvements, benefitting both commercial and general (private) aviators. Those include new “run-up” areas, which allow pilots to perform pre-flight checks before pulling onto the taxiway. The airport’s Medium Approach Light System with Runway Alignment Indicator Lights (MALSR) — the approach lighting system that provides the basic means of transition from instrument flight to visual flight for landing — will also be replaced to meet current standards. Airport administrators also hope to reduce wildlife strike hazards through improved storm water drainage. The FAA over the past year has launched a new effort to reduce instances of potentially dangerous aircraft encounters with birds and even land animals. Replacement of Curtis Steinberg Road, the central roadway between the airport and the industrial park, is also planned. Typifying the kind of new tenant that administrators hope the improvements will attract to their hangar space is Fostaire Helicopters, already headquartered at the Cahokia airport. The second largest charter helicopter service in the country, Fostaire offers conventional helicopter transportation for passengers and freight, as well as specialized services such as preventive power line patrols for utility companies and troubleshooting for power outages and other problems following storms. Fostaire also works on construction projects with pipeline companies across the nation, as well as the Army Corps of Engineers. Its subsidiary North American Helicopter offers copter maintenance and repair services for clients across the U.S. as well as a helicopter flight school. “Especially on the east side of the river, the economic development over here is a great thing,” said Chris Bailey, the CEO of Fostaire Helicopters. Other current tenants include a Jet Aviation aircraft maintenance modification service center, operated by a division of General Dynamics, and two full-service 24-hour fixed-base operators, which offer aviators services such as fueling, hangar space, tie-down and parking, aircraft rental, aircraft maintenance, and flight instruction. The Center for Aviation Science, Saint Louis University’s flight school, remains in the St. Louis Downtown Airport complex; currently with more than 900 students from over 20 countries. The Greater St. Louis Air & Space Museum is also on the airport grounds. As a means of promoting the airport, officials are encouraging the museum, the SLU aviation center and the local chapters of national aviation organizations host more flying competitions and other events at the facility. Administrator also hope to begin attracting the national meeting of major aviation organizations such as the Aircraft Owners and Pilots Association and the Experimental Aircraft Association.